The people of Lafia trooped out last Tuesday to welcome the nation’s number one citizen to Nasarawa State. The enthusiastic welcome was an indication that Buhari still pack a lot of muscle and those who are thinking of taking him on should consider what they are up against. 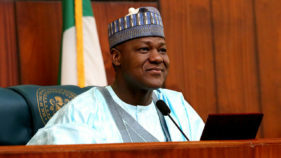 However, it is clear too that the ruling All Progressives Congress (APC) is restive and rebellion is rearing its head from unexpected quarters. This is more so when its reign, despite the resounding victory Buhari recorded in 2015, now seems precarious if not endangered. Buhari is the first politician to lead the progressive camp to victory at the Federal level. All attempts in the past, in 1959, 1964, 1979, 1983 and the since the return of democratic rule in 1999 have failed before the tumultuous ride to power by Citizen Buhari. Now he is facing allegations of reckless partisanship, unblinking nepotism and of heart-breaking incompetence. It does not help matters that some terrorist elements have succeeded in hijacking the sporadic burst of violence by suspended Fulani herdsmen and have killed more Nigerians under the watch of Buhari than even the notorious Boko Haram insurgents. Yet the Chief of State is a celebrated retired general, who at the height of his career as the General Officer Commanding the 4th Division in Jos, confronted elements of Islamist groups and drove them deep into the neighbouring Republic of Chad. Now he is in power and seems powerless. Or so it seems. Former President Goodluck Ebele Jonathan once warned that elements of the Boko Haram were within the government. He did nothing about them. Some big men were hurled in, but ultimately, nothing happened to the big men. No senator was convicted, no governor and no paladin in the corridors of power. We are left with the rabbles and the ill-clad drugged fanatics paraded occasionally on national television. We know it is simply not possible that it would be these ragtag men who would be the mastermind of the carnage that Boko Haram has been able to wreck on our beloved country. So are the Boko Haram enthusiasts still embedded in the sanctum of power? Is the herdsmen menace the new transmutation of the Boko Haram terrorist group? How do we explain the mindboggling violence in Benue, Taraba, Plateau and Kaduna States? How could the President appears powerless in the face of this direct assault and challenge to his powers as the repository of the sovereignty of Nigeria? How can he be invested with so much powers by the Constitution and still appears so powerless? Buhari’s Lafia pronouncement is an indication that the old Buhari is back. He can bark, but now we need to know that he can also bite and that he has a good set of teeth. Nigerians need to know those who are in the command and control centre of the terrorist groups ravaging throughout the country. That is why the country is spending so much money on the Directorate of State Service, the Police, the National Intelligence Agency, the Directorate of Military Intelligence and several others. Their commanders should be given the matching order: perform or get fired. It is time Buhari learn how to cut heads, especially among those homeboys who dominate the command of his intelligence and security apparatus. Nigerians would be ready to forgive him his past lapses if only he can show some serious actions. The road to 2019 would be less fraught with uncertainties if Nigerians see their President doing what he was voted in to do: defend them and defend the Constitution. He needs to show better grip of his job instead plotting to stay in power for two terms. 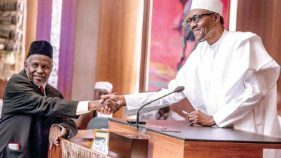 On Tuesday, Aso Rock announced the appointment of Asiwaju Bola Ahmed Tinubu, the leader of the ruling APC and former governor of Lagos State, as the chairman of the “Reconciliation Committee.” This is the first official indication that the ruling party and its several factions need reconciliation. Tinubu is the leader of a formidable faction of the party which contributed greatly to the decisive victory of Buhari in 2015. He is the dominant leader from the Yoruba heartland of the South-West. Since coming to power, Buhari has compensated the zone with powerful ministerial posts and other appointments. The Vice-President, Professor Yemi Osinbajo, is also from the zone. Yet there had been grapevine stories that Tinubu may be having problems with the embedded principalities at the Aso Rock Villa. So now that he is to bring peace to the family, he may well start with himself. I don’t know whether Tinubu’s assignment include appeasing the two old men who have fired salvos at Buhari in recent weeks. Former President Olusegun Obasanjo is a seasoned polemicist who is noted for his accurate shots through his occasional letters to the rulers of Nigeria. Three weeks ago, he released a missile into the Buhari camp. But wise counsel prevailed. The Buhari team, noted for its bristling muscularity in the face of challenges, responded coyly like a chastised bride. They know that Obasanjo, former commander of the famed Third Marine Commando Division during the Nigerian Civil War, would not embark on a public fight unless he had calculated the cost and assume that he would win. Moreover, there are few people in the world who could claim that they know Buhari better than Obasanjo. They have been together for more than 50 years. When Buhari and his team seized power from President Shehu Shagari in 1983, they described their regime as an “offshoot of the Murtala-Obasanjo regime.” That encouraged the press to also call the Buhari regime, the Buhari-Idiagbon regime. Major-General Babatunde Idiagbon, the Chief of Staff, Supreme Headquarters, was Buhari’s deputy just as Obasanjo served as the deputy to General Murtala Muhammed until the latter was killed during the bloody coup attempt of February 13, 1976. Buhari, who was appointed a military governor by Mohammed, later served as Minister of Petroleum under Obasanjo. Then another salvo came last week from Buhari’s old friend and time-tested nemesis, General Ibrahim Babangida. 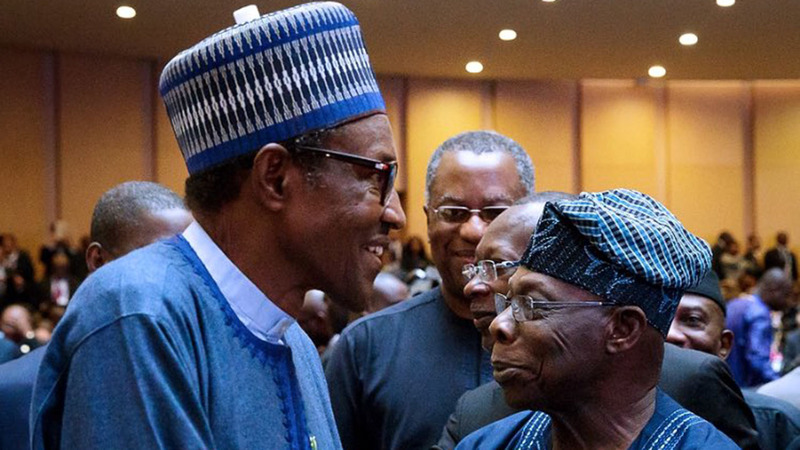 The self-proclaimed military President was unequivocal in supporting Obasanjo position that Buhari has failed in his primary assignment of protecting life and property. The government must have decided to respond quickly to Babangida underhand challenge. Few hours after the initial statement became public; another statement came denying that it emanated from the old soldier. Kassim Afegbua, Babangida’s spokesperson for almost 20 years, re-affirmed that the first statement was authentic. He went on national television to denounce the disclaimer. In a bizarre twist, the Inspector-General of Police declared Afegbua wanted like a fugitive criminal. Afegbua, who served in the Edo State APC government of Comrade Adams Oshiomhole, slammed the IG with a civil suit, claiming damages. Babangida has a delicate relationship with Buhari. Both of them have been parts of national politics since the coup of July 29, 1966 which brought General Yakubu Gowon to power. After the assassination of Murtala Muhammed, Obasanjo and the then Chief of Army Staff, Lt. General Yakubu Danjuma, had considered bringing in Buhari to become the Chief of Staff Supreme Headquarters. In the end, the mantle settled on the broad shoulder of then Lt. Colonel Shehu Musa Yar’Adua, son of the Minister of Lagos Affairs during the regime of Abubakar Tafawa-Balewa. By 1983, Buhari was GOC while Babangida, who belonged to the Armour Corps, had become an institution at the Defence Headquarters, Lagos. Babangida later served Buhari as Chief of Army Staff for 20 testy months. When Babangida replaced Buhari in a palace coup, most Nigerians were happy, for they were tired of Buhari’s capricious and brutal dictatorship. Now Buhari is back and Babangida is in what looks like a final retirement. The salvo from Minna is a reminder that he still has considerable influence and next to Obasanjo, his may be the loudest voice in the Republic. The harassment of Afegbua show that the Buhari camp is ready to trade punches with his old foe not minding the cost. If the truth must be told, the idea of three old men in the boxing ring is not a pretty sight. However, the message of Obasanjo and Babangida is clear: Buhari has not done much to justify a second term. By 2019, he would be 76, perhaps too old for the fast tempo and dynamic responses that is required of a Nigerian Chief of State. His regime has also been bedeviled by reckless insularity and self-righteous proclamations when the evidence suggests that it should be contrite. 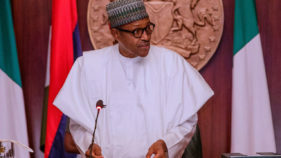 Now the pronouncements of the two old men have engendered movements in the land aimed at ensuring that in the events Buhari does not intend to abide by their advice, they are ready to engage him on a higher plane. The two old soldiers should know by now that despite his age and his less than brilliant performance, Buhari still pack a lot of political muscles and he would not be a push-over. However, he would be doing himself and Nigeria a great favour if he abides by the advice of these old men. He may not be tired, but there is always a time for retirement. Even for a ramrod general.